Our integration with CircleBack enables you to quickly capture email signature information to create or update your contacts from Gmail. 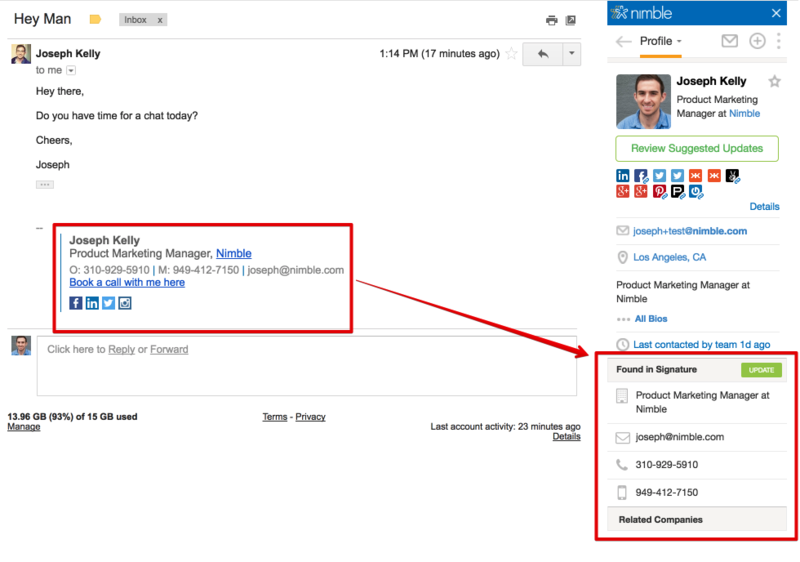 Capture contact information from email signatures in Gmail when you enable CircleBack in the Nimble Smart Contacts App. To get started, be sure that you already have the Nimble Smart Contacts App installed in Chrome. Next, go to your Integration Settings in Nimble, and select "Enable" next to CircleBack. Confirm the email account you wish to use with CircleBack, and you'll be all set to go. What fields get captured from email signatures? Enable CircleBack in the Smart Contacts App for Chrome to capture information from email signatures to update or create new contacts. To enable the integration, open the Smart Contacts App in Gmail and confirm that you wish to enable the integration. Once enabled, your Smart Contacts App will use the power of CircleBack's email capture to add or update information on your Nimble contacts.